T-Rex Machinery has become synonymous with high quality machinery targeting the meat processing market. It produces machines for mincing, processing and packaging various meat products. The latest offering in cooperation with Meatec is the JetStream smoking and cooking cabinet aimed at the delicatessen meat producers. Traditionally smoking cabinets have been challenging when it comes to being energy and water efficient. The process can use up to 400 kWh of power and up to 200 l of water per hour. In contrast the JetStream is proving to be a success due to the energy and water saving technologies incorporated in it by reducing the use of power and water by up to 70%. According to Steve Stopforth, MD for T-Rex Machinery, the market is becoming increasingly sensitive to rising costs of production through wastage of commodities such as water and electricity. The actual input cost in the production is now having to be factored into production. With an expected yearly 9% increase for electricity, Eskom has initiated a drive to encourage the introduction of next generation machines into the market. By incorporating energy saving technologies at the point of manufacture this would make it easier for end-users to accept the initiative without the fuss of retrofitting expensive aftermarket solutions to existing systems. However, there cannot be compromise when it comes to the quality of the machine or the product being processed. This is where the correct use of technology comes into the scene. Rather than propriety electronics being developed at great cost, T-Rex elected use of the rack PAC’s by LS Industrial Systems for its cost effectiveness. The XEC-SU PAC was chosen for its ability to perform accurate PID temperature control by means of the XBF-RD01 PT100 temperature plug-in module. Using the XEC-SU’s onboard RS-485 port, the fan system is controlled using the LSIS-iG5A- 4 VSD which is able to deliver 150% power boost when needed and is able to evacuate the cabinet in a very short time. The JetStream would not be complete without an HMI and the one chosen by Meatec from T-Rex for the ProJet is the new LSIS-ePX60TTA. This HMI is packed with innovative technology, which makes for a good looking interface that is highly responsive to operational updates. 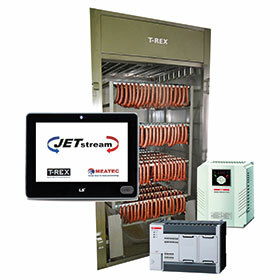 Alan van Schoor, director for AVS Automation was commissioned to integrate the JetStream for T- Rex. Formerly a Siemens systems integrator, he was delighted with the simplicity of the IEC compliant LSIS XG5000 PAC programming software. He was able to write process controls that are intuitive and using the LSIS XP-Builder was able to create alphanumeric recipes allowing the fleischmeisters to create, save and password their own recipes. Password protection prevents fiddling by operators to ensure a consistent product at the end of the cycle. With the safety lock and signature functions in the LSIS XG5000, the program is able to be locked from potential intellectual property hijackers. Keeping track of the batches and quality of the product is achieved with the built-in reporting system integrated into the eXP60TTA. Van Schoor commented that the software allowed him to see the true program in a logical and coherent way without the complications he had to deal with previously. This is good news for LS Industrial Systems. Thus the JetStream Smoking Cabinet by T-Rex in conjunction with Meatec is set to lead the way using less expensive technologies without the fuss of propriety systems, making for a system that pleases Eskom and the fleischmeisters pocket with a knock-on saving to clients. This complies well with LSIS’ Future Smart Energy initiative. Please contact us at 0861 32 33 34 or email us at sales@anadigi.co.za for a free consultation or quote.